Background: Irrigation protocol is the most critical step during the disinfection of an infected root canal system. Aim: The purpose of this study was to determine the root canal irrigation trends being practiced among the endodontic teaching faculty and post-graduate students in the dental colleges present in India. Materials and Methods: A postal invitation to participate in this national survey was sent to the Department of Conservative Dentistry and Endodontic of 294 Dental Colleges present in India. A total of 2389 forms were successfully delivered out of which 794 duly filled forms were received back. Survey participants were asked about their irrigant selection, irrigant concentration, smear layer removal protocol, and use of adjuncts during irrigation. Results: This survey elicited a positive response rate of 33.23%. Our data indicated that 92.8% of respondents use sodium hypochlorite (NaOCl) as the primary endodontic irrigant, with 26 gauge needle being most preferred for syringe irrigation, with 49.3% of them using it at a concentration of 2.6-4.0%. 68% of our respondents aim to remove the smear layer during the endodontic treatment while 47% reported using ultrasonic activation as an adjunct during their irrigation protocol. Conclusions: The findings of this survey are that the majority of teaching institutions in India are employing NaOCl (2.6-4.0%) as the primary endodontic irrigant. The concept of smear layer removal is high (68%), and there is a general trend (78%) to modify the irrigation protocol according to the status of the pulp, status of the periapex and in retreatment cases. The presence of necrotic or vital tissue remnants within the root canal space may provide a source of nutrition for the surviving bacteria. Thus, microorganisms, either remaining in the root canal space after treatment or those re-colonizing the filled canal system, are the main etiological causes of endodontic failures. The role of the irrigation protocol thereby plays a key role in the disinfection of the root canal space. The ideal root canal irrigant has been described by Zehnder  as being systemically nontoxic, non-caustic to periodontal tissues, having little potential to cause an anaphylactic reaction, possessing a broad antimicrobial spectrum, capable of dissolving necrotic pulp tissue, inactivating endotoxins, and either preventing the formation of a smear layer or dissolving it once it has formed. Although many kinds of endodontic irrigants have been investigated; none have been able to exhibit all the above mentioned properties. The purpose of this survey was to ascertain the current irrigation protocol followed by endodontic faculty and post-graduate students in Indian dental colleges. This is the first comprehensive survey of this nature, which has been conducted in India. Our survey was based on the survey employed by Dutner et al. among members of American Association of Endodontists and published in the Journal of Endodontics (2012). A modified form was created, and a postal invitation to participate in this national survey was sent to the Department of Conservative Dentistry and Endodontic of 294 Dental Colleges present in India. A total of 2389 forms were successfully delivered by speed post-after accounting for seven undelivered post-covers containing a total of 35 survey forms. A total number of 794 duly filled forms were received back by us. Survey participants were asked about their irrigant selection, irrigant concentration, smear layer removal, and use of adjuncts to irrigation. Questions consisted of numeric rankings, multiple choices, and multiple selections with options for write-in answers where appropriate. A sample of the survey questionnaire given to participants is given in [Table 1]. The data were collected and analyzed using SPSS software version 17. A total of 2389 survey, forms were successfully delivered by speed post-after accounting for seven undelivered post-covers containing, total of 35 survey forms. There were 794 participants, with an overall positive response rate of 33.23%. As the purpose of this survey, was to ascertain the clinical irrigation protocol being employed in Dental Colleges in India, the survey participants comprised of post-graduate students and endodontic teaching faculty with varying years of experience. The respondents of our survey, comprised of 47% being post-graduate students, 26.4% were teaching faculty with less than 5 years of experience, 11.8% were faculty with 5-10 years of experience, 9.3% were faculty with 11-20 years of experience, 3.8% were faculty with 21-30 years of experience and 1.6% respondents were faculty with a clinical experience of more than 30 years. Among all experience groups, our data indicate that 92.8% of respondents are employing NaOCl as their primary irrigant [Figure 1]. When asked to rank the reasons for their primary irrigant selection, antibacterial capability was most important, followed in order by tissue dissolution, biocompatibility, substantivity, and expense. 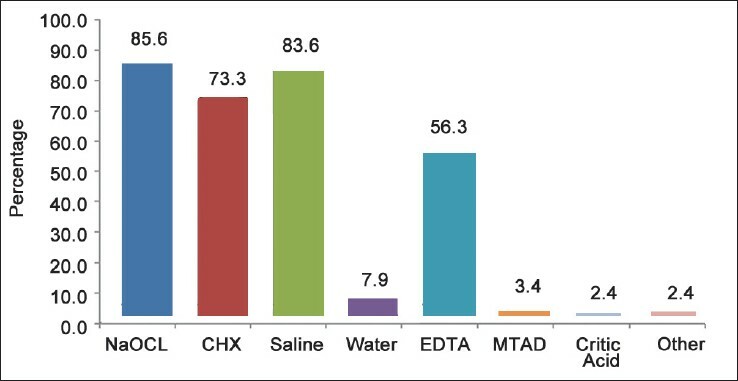 The majority of respondents are also including saline (83.6%), CHX (73.3%), and EDTA (56.3%) in their irrigation protocol [Figure 2]. Most respondents surveyed (49.3%) use 2.6-4.0% strength NaOCl [Figure 3]. 49.4% of the respondents claim to use 5-10 ml of irrigants per canal. The results of this survey indicate that 73.3% of respondents also employ CHX as an irrigant with 83% of the positive respondents using 2% as the preferred concentration of CHX. 68% of respondents aim to remove the smear layer during the endodontic treatment. Most respondents (78%) claim to alter their irrigant selection on the basis of pulpal or periapical diagnosis. 47% of respondents use ultrasonic activation as adjunct to irrigant activation, where as 17% claim to use other activation techniques such as manual dynamic activation (MDA) and K-file activation while 12% use subsonic systems such as EndoActivator (Advanced Endodontic, Santa Barbara, CA). 7% of those surveyed are also using sonic activation and only 2% of those surveyed use negative pressure irrigation with systems such as EndoVac. Our survey was based on the survey employed by Dutner et al. amongst members of American Association of Endodontists. The main objective of our survey was to ascertain the irrigation trends being followed in various Dental Colleges present in India. The positive response rate in our survey was 33.23% while this was 94.5% in the Australian survey,  85% in the United Kingdom survey,  72% in North Jordan survey,  58.1% in American survey I conducted during 2001,  and only 28.5% in American survey II conducted during 2012. The comparison of similar surveys similarly carried out in different countries are given in [Table 2]. In our survey, an overwhelming 97% of respondents indicated that 26 gauge needle was being employed as the primary irrigation needle for the delivery of endodontic irrigants. 92.8% of the respondents selected NaOCl as the primary irrigant. 91% of respondents in the American survey II and 94% in the Australian survey also chose NaOCl as their primary irrigant. 63% of respondents selected local anesthetic solution as primary irrigant in the United Kingdom survey while 33.6% selected hydrogen peroxide as primary irrigant in the North Jordon survey. When asked for the percentage of NaOCl employed, in our survey 49.3% of respondents claim to use 2.6-4.0% NaOCl where as 57% of the respondents claim to use >5% NaOCl in the American survey II conducted in the year 2012. 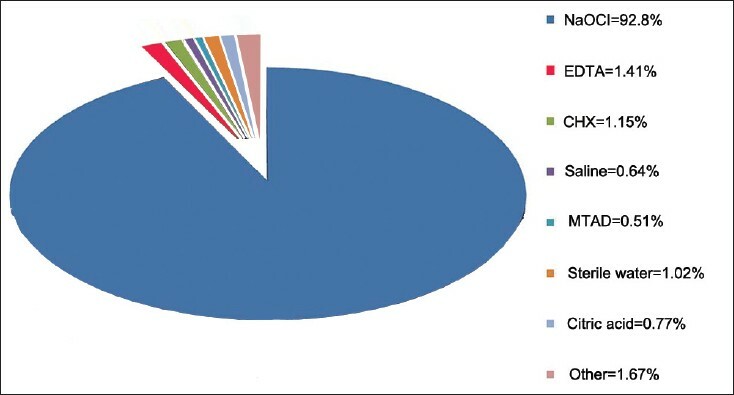 1% NaOCl was the most common concentration reported in the Australian survey (2003) and 0.5% NaOCl was commonly employed among the participants of North Jordan survey (2004). The American survey I (2001) revealed that 51% of practicing Endodontists removed the smear layer before obturation of the root canal system,  while the American survey II (2012) revealed that 77% of Endodontists removed the smear layer. In our survey, 68% of our respondents claim to remove the smear layer during endodontic procedure. According to our survey the highest ranked reasons for irrigant selection is its antibacterial and tissue-dissolving capability. It was found that 49.9% of the respondents use more than 5-10 ml of irrigants per canal during the shaping and cleaning procedure. 78% of respondents in our study stated that their choice of irrigant might change on the basis of pulpal and periapical diagnosis. The primary irrigant employed for teeth with vital pulp was NaOCl (79.3%). The primary irrigant employed for teeth with the radiographic evidence of periapical lesion was CHX (54.2%). CHX is also the preferred irrigant in retreatment cases (56.2%). Although, 78% of our respondents say that they change their irrigant according to periapical diagnosis, 92.8% use NaOCl as their primary irrigant. Incidentally, in the American survey II, 66% of the respondents said they do not alter the irrigant based on the condition of the pulp and periapex. When asked about adjuncts used for irrigation, participants were given choices including ultrasonic activation, sonic activation, subsonic activation, and negative pressure. Subsonic activation was included as a choice because devices such as the EndoActivator (Advanced endodontic, Santa Barbara, CA) are sometimes described in this manner. In our study, 47% of the respondents are using ultrasonic activation, 19% using sonic (or subsonic) activation and 17% using other activation techniques such as MDA and K-file activation. Use of ultrasonic adjunct was 48% among Endodontists in the American survey II. 1. Haapasalo M, Shen Y, Qian W, Gao Y. Irrigation in endodontics. Dent Clin North Am 2010;54:291-312. 2. Peters OA, Schönenberger K, Laib A. Effects of four Ni-Ti preparation techniques on root canal geometry assessed by micro computed tomography. Int Endod J 2001;34:221-30. 3. Love RM. Enterococcus faecalis: A mechanism for its role in endodontic failure. Int Endod J 2001;34:399-405. 4. Zehnder M. Root canal irrigants. J Endod 2006;32:389-98. 5. Siqueira JF Jr, Batista MM, Fraga RC, de Uzeda M. Antibacterial effects of endodontic irrigants on black-pigmented gram-negative anaerobes and facultative bacteria. J Endod 1998;24:414-6. 6. Siqueira JF Jr, Rôças IN, Favieri A, Lima KC. Chemomechanical reduction of the bacterial population in the root canal after instrumentation and irrigation with 1%, 2.5%, and 5.25% sodium hypochlorite. J Endod 2000;26:331-4. 7. Silva LA, Leonardo MR, Assed S, Tanomaru Filho M. Histological study of the effect of some irrigating solutions on bacterial endotoxin in dogs. Braz Dent J 2004;15:109-14. 8. Spangberg L, Engström B, Langeland K. Biologic effects of dental materials. 3. Toxicity and antimicrobial effect of endodontic antiseptics in vitro. Oral Surg Oral Med Oral Pathol 1973;36:856-71. 9. Naenni N, Thoma K, Zehnder M. Soft tissue dissolution capacity of currently used and potential endodontic irrigants. J Endod 2004;30:785-7. 10. Calt S, Serper A. Time-dependent effects of EDTA on dentin structures. J Endod 2002;28:17-9. 11. Torabinejad M, Khademi AA, Babagoli J, Cho Y, Johnson WB, Bozhilov K, et al. A new solution for the removal of the smear layer. J Endod 2003;29:170-5. 12. Gu LS, Kim JR, Ling J, Choi KK, Pashley DH, Tay FR. Review of contemporary irrigant agitation techniques and devices. J Endod 2009;35:791-804. 13. Munoz HR, Camacho-Cuadra K. In vivo efficacy of three different endodontic irrigation systems for irrigant delivery to working length of mesial canals of mandibular molars. J Endod 2012;38:445-8. 14. van der Sluis LW, Wu MK, Wesselink PR. The efficacy of ultrasonic irrigation to remove artificially placed dentine debris from human root canals prepared using instruments of varying taper. Int Endod J 2005;38:764-8. 15. Blank-Gonçalves LM, Nabeshima CK, Martins GH, Machado ME. Qualitative analysis of the removal of the smear layer in the apical third of curved roots: Conventional irrigation versus activation systems. J Endod 2011;37:1268-71. 16. Dutner J, Mines P, Anderson A. Irrigation trends among American association of endodontists members: A web-based survey. J Endod 2012;38:37-40. 17. Clarkson RM, Podlich HM, Savage NW, Moule AJ. A survey of sodium hypochlorite use by general dental practitioners and endodontists in Australia. Aust Dent J 2003;48:20-6. 18. Whitworth JM, Seccombe GV, Shoker K, Steele JG. Use of rubber dam and irrigant selection in UK general dental practice. Int Endod J 2000;33:435-41. 19. Al-Omari WM. Survey of attitudes, materials and methods employed in endodontic treatment by general dental practitioners in North Jordan. BMC Oral Health 2004;4:1. 20. Moss HD, Allemang JD, Johnson JD. Philosophies and practices regarding the management of the endodontic smear layer: Results from two surveys. J Endod 2001;27:537-9. 21. Metzger Z, Basrani B, Goodis H. Instruments, materials, and devices. In: Hargreaves K, Cohen S, editors. Pathways of the Pulp. 10 th ed. St Louis: Mosby; 2011. p. 255.